Get the The Ultimate Matrix Collection [Blu-ray] for less than $25.49 (that’s 61% off the list price of $64.98). Its Tuesday, which means I let you know the latest DVD and Blu Ray deals. This is CyberMonday Deals Week at Amazon which means some crazy deals.Today's Gold Deal is the seven (or ten on DVD) disc set of the Ultimate Matrix collection. I described my love for the original Matrix and dislike for the sequels already. I'll just say these films are important yet flawed. The Blu-Ray and DVD collection of the trilogy is inspired though. The first movie has been digitally enhanced so that it matches the clarity and color palette of the sequels. All three films now include two audio commentaries: one by the film critics Todd McCarthy, John Powers and David Thomson; and one by the philosophers Ken Wilber and Cornel West. In a written introduction, the Wachowski's explain that this is to inspire an implied dialogue between both camps so that the audience "might triangulate their own position". The set also features The Matrix Reloaded Revisited and The Matrix Revolutions Revisited, two new 'making of' documentaries on the sequels, divided into segments on larger sequences or aspects of production, which may in turn be viewed as short (~5-20 minute) segments. 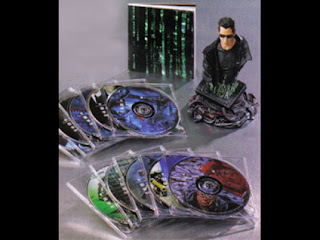 The Reloaded Revisited disk also includes the footage shot especially for the Enter the Matrix video game, which previously could only be seen after having completed certain parts of the game. Three of the disks are not connected to specific movies in the series. "The Roots Of The Matrix" contains two short documentaries, discussing the philosophy and science of the series as a whole. "The Burly Man Chronicles" provides a documentary on the trials and tribulations faced by the crew in the production of "The Matrix Reloaded" and "The Matrix Revolutions." Finally, "The Zion Archive" is a collection of information on the merchandising, marketing and spin-off franchises; as well as miscellaneous material such as concept sketches. Originally selling for over $79.99 IGN gave it a nine out of ten. Smokin' deal. This sale is for only for today, Tuesday, November 29, 2011, until 11:59PM PST while supplies last. These will probably sell out quick so act now! In this week's new releases Smallville Season 10 came out on Blu-Ray along with a cheesy Japanese sci-fi film called Zebraman. Not only is it Zebraman. It's Zebraman 2: Attack on Zebra City! So it's gotta be good. What do you think of the Matrix trilogy or Smallville? Would you buy this week's deal? Is there a deal you'd like to share? Let us know in the comments! That's not a bad deal. I enjoyed all three movies. Have them on DVD, but not BluRay or digital. Matrix saga is one of the best thing that cinema had give us. The sequels are more profound then the first film.